You can watch a full recording of this event here. 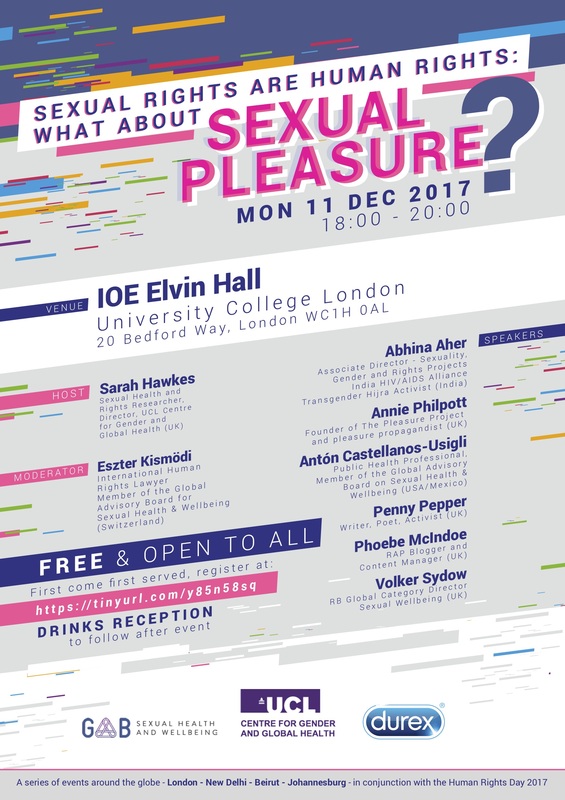 The Global Advisory Board (GAB) for Sexual Health and Wellbeing, in collaboration with the UCL Centre for Gender and Global Health and Durex™, are organising an interactive panel discussion on “Sexual Rights are Human Rights: What about Sexual Pleasure?” on 11 December 2017 (Monday) 18:00-20:00 at Elvin Hall, Institute of Education, UCL, in conjunction with Human Rights Day. This event will bring together academics, human rights activists, health professionals, youth activists, private sector and other experts to discuss issues around human rights and sexual pleasure from a multi-disciplinary perspective. The discussion will focus on rights and positive sexuality in the context of sexual, gender and bodily diversity, age, disability, culture, education, religion, non-discrimination and to be free from violence. It will be an interactive discussion among the panelists and the audience. The event is free and open to all but registration here is required. The panel discussion will also be livestreamed here and made available to watch after the event. Follow the event on Twitter @UCLGenderHealth. To hear about further events in our speaker series, please subscribe to our mailing list here or send an email to igh.gendercentre@ucl.ac.uk.